Most of you know by now that "the backlist is back." My earlier out-of-print novels (and one story collection)--Funerals for Horses, Earthquake Weather and Other Stories, Electric God and Walter's Purple Heart--are now available as Kindle ebooks. And through Saturday, they are free. A sort of introductory promotion, a way to let people know they're out there. And a way to say thank you to my faithful readers. So that's a reminder of a previous announcement. Many more details and all the links you'll need in my last blog post, The Backlist is Back! And Briefly Free! 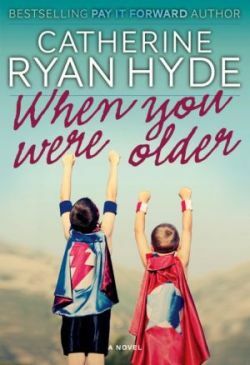 I have another frontlist title coming out in the US this month, When You Were Older. It will be a Kindle ebook and a paperback as well. Look for it around Thanksgiving. And, of course, watch this blog for updates. Next year (which is not far away) Amazon publishing is re-releasing When I Found You, and bringing out a brand new frontlist title for US readers. It's called Walk Me Home, and I'll be creating a book page for it today. It's scheduled for publication on April 30th. Check it out by following the link. UK readers, it will be out with Transworld/Black Swan in the summer and is also available for preorder. More news as it breaks! As I'm sure you've noticed, things are moving fast now, so please stay tuned! The Backlist is Back! And Briefly Free!